This fast-paced, easy-to-read narrative reveals how God usedone man of great courage, discipline, and humility to bringcountless souls to Christ. God's accomplishments through George Whitefield are to this dayvirtually unparalleled. In an era when many ministers were timidand apologetic in their preaching, he preached the gospel withaggressive zeal and undaunted courage. In the wake of his fearlesspreaching, revival swept across the British Isles, and the GreatAwakening transformed the American colonies. The previous two-volume work George Whitefield: The Life andTimes of the Great Evangelist of the Eighteenth-CenturyRevival is now condensed into this single volume, filled withprimary-source quotations from the eighteenth century, not onlyfrom Whitefield but also from prominent figures such as John andCharles Wesley, Benjamin Franklin, and William Cowper. God's accomplishments through George Whitefield are to this day virtually unparalleled. In an era when many ministers were timid and apologetic in their preaching, he preached the gospel with zeal and undaunted courage. In the wake of his fearless preaching, revival swept across the British Isles, and the Great Awakening transformed the American colonies. The previous two-volume work George Whitefield: The Life and Times of the Great Evangelist of the Eighteenth-Century Revival is now condensed into this single volume, filled with primary-source quotations from the eighteenth century, not only from Whitefield but also from prominent figures such as John and Charles Wesley, Benjamin Franklin, and William Cowper. 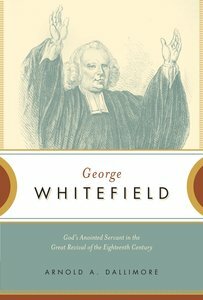 About "George Whitefield: God's Anointed Servant in the Great Revival of the Eighteenth Century"
Customer Reviews For "George Whitefield: God's Anointed Servant in the Great Revival of the Eighteenth Century"
George Whitefield was a devoted man of prayer and the word. A lesser known figure from the methodist movement, often overshadowed by the Wesleys, Whitefield was happy to give up his name in order that Christ may be preached. A truly diligent and hard working servant of God, Whitefield was used by God to bring thousands if not hundreds of thousands to Christ both in England and America. This biography is particularly well written and will engross you in no time. I would also highly recommend the 2 volume edition by the same author which includes more background history around the Wesleys, England and America at the time and other key Christians of that era.